Do you ever have that feeling where you just want to take off your shirt, put on your mask and start wrestling people? No? Just me? Well I played a game this past week where you don’t get that choice. Drinkbox Studios from Toronto has created an action packed game in their luchador simulator Guacamelee!. Well it isn’t so much of a luchador simulator as more of a 2-d platforming brawler with style oozing from every orifice. Guacamelee! is inspired by Mexican folklore, set between the worlds of the living and the dead. Players take control of a downtrodden agave farmer named Juan Aguacate who has to fight through hordes of undead enemies to stop the evil Carlos Calaca from gaining ultimate power by sacrificing the beautiful "El Presidente's Daughter.” Once you finish the short tutorial, the female luchador Tostada can join in as your tag team partner for co-op play at any time throughout the game. 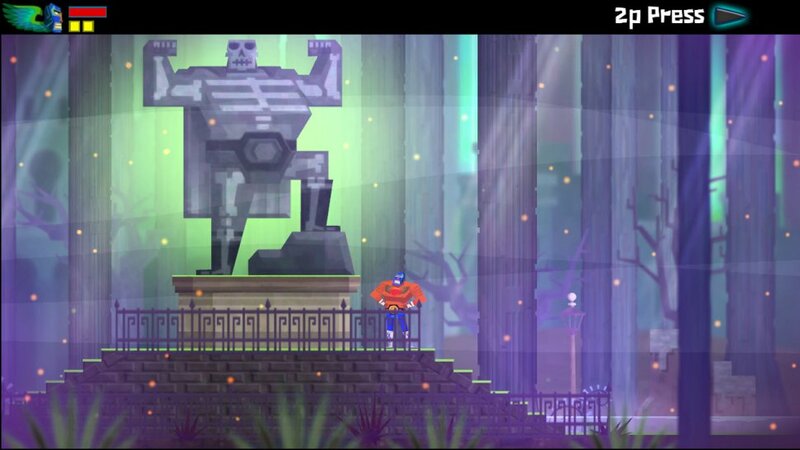 Set in and around a small village in Mexico, Guacamelee! has players punch, suplex, and pile drive enemies into a pulp, while travelling through alternate dimensions. Guacamelee! expands upon many classic games by blurring the boundaries between combat and platforming, making many of the moves necessary to use for both of these. Guacamelee! pays homage to many other games, referencing every game it can through winks and nods throughout the environment. Drinkbox actually describes Guacamelee! as a Metroid style game, heck it even features Chozo statues to unlock your powers. The 2d game world is entirely open-ended and chock full of secrets and areas that are inaccessible until you have the proper abilities and equipment. In this case, Juan and Tostada inherit fighting moves from a mystical goat that benefit them in both battle and exploration. Who doesn’t want to use a ‘rooster uppercut’ to open both a doorway and an enemy’s skull? 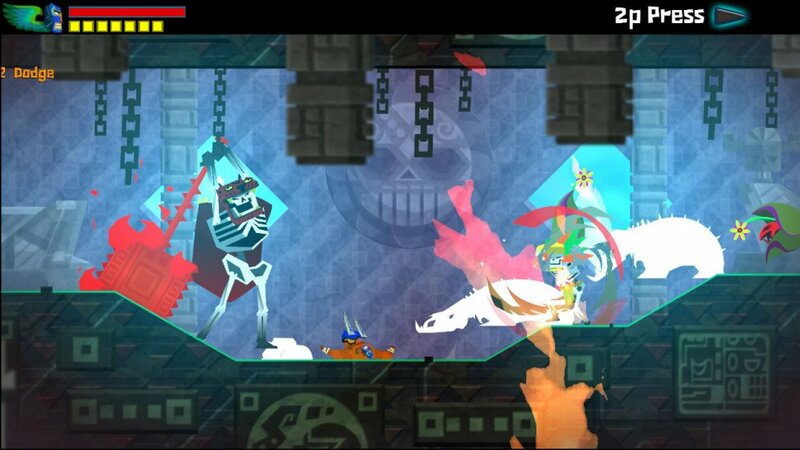 The combat in Guacamelee! gradually builds your arsenal of wrestling moves throughout the game. The initially bland set of punches and kicks you start out with eventually give way to more specialized moves like ground pounds and suplexes. These can be mixed together for some impressively complex combos especially when you toss enemies back and forth between co-op partners. Taking things one step further, Guacamelee! throws in enemies that can only be defeated with a certain colour coded-attack, making for some interesting brawls. The game doesn’t scale at all, so co-op play makes the combat much easier with a friend. Battles leave with you coins to purchase new skills while you will need to find hearts and gold to upgrade your health and stamina. All three currencies are the primary rewards for exploration and the game world is filled with hidden treasure chests in what regularly seem to be impossible-to-reach areas. Page created in 0.5616 seconds.